Background Nursing care addresses several complex interventions and international research into complex interventions is growing. 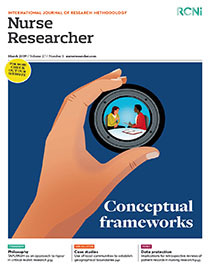 The Medical Research Council framework (MRC-f) is the most cited framework describing the development and evaluation of interventions, but little is known about its use in nursing sciences. Aim To review the literature for uses of MRC-f in developing complex interventions. Discussion Of 287 studies initially identified; the final sample comprised 13 papers. Most studies referred to the development or feasibility phase and were performed in the community. They were mainly focused on the physical dimension and few had a holistic approach. The lack of time and financial support, the subjective nature of these interventions, and difficulties in the recruitment of participants were reported as barriers. Conclusion The use of MRC-f in the study of complex interventions is recent in nursing research, but it enhances the design of more feasible and effective nursing interventions. The lack of time, difficulties in the recruitment of adequate sample sizes and lack of financial support were identified as important barriers in the development of complex nursing interventions. Implications for practice Nurse researchers need to develop skills in planning and conducting research into complex interventions. Academic courses may also be helpful in improving such skills.